How do I teach my turtle to eat food that doesn't move. My name is Dani, I'm only 14, and I have a box turtle named Franklin. And when i say small, I mean he fits in my palm small. I found him around August of 2008 and he's grown a smudge. But not much that you could actually tell. 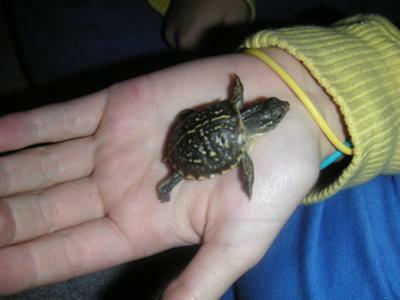 The reason why I kept him was because I read that most baby box turtles don't survive during the hibernation. My dad and I always feed him worms that we dig out from our backyard. He has fun attacking them, And we have fun watching him! But we read that you can feed them other nutritious stuff. Like carrots, grapes, and tomatoes. So i put a carrot in his habitat. But I'm thinking that we've trained him to only eat stuff that moves. So he won't eat the carrot. I don't know what I should do to show to him that he can eat the carrot. Plus when he gets older and bigger. I want him to be able to walk around that house. Is that a good idea? And sometimes he snaps at me. But I'm thinking that's only because He thinks I'm giving him a worm. It's so cute. He walks up to the glass when I walk by him Because he knows I'm going to give him food! Is there any contact I should do to make him not so snappy. Like should I hold him more often? Comments for How do I teach my turtle to eat food that doesn't move.